WELCOME to Feedback! Make yourself at home! 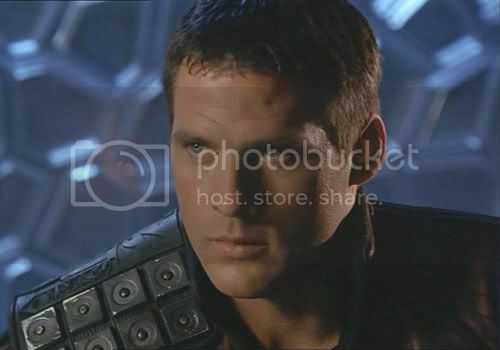 Now that John has found the location of Katratzi, he and the crew make their way towards Scarren space to rescue Aeryn. But first they need to clear quarantine and security at the border station. As this normally takes 5 days, luck would have it that Jenek’s freighter, with Aeryn on board, is still there … but not for long They have half an arn to come up with a plan to stop the freighter from leaving and taking Aeryn with it. John’s first attempt to rescue Aeryn leads to his capture and Scarren interrogation. Now another plan has to be put into place to rescue the girls. John must wait for Sikozu to cut the station’s power to enable this to happen. The Charrids and Kalish are not going to make it easy though … surprise surprise!! Throughout these proceedings, Scorpius has tried in vain to keep Jenek preoccupied, which in turn leads to his capture. Wonderful write-up and picture choice Nette. Hey everyone. Clorinda is going to be a few minutes late and said don't wait on her she will jump in when she gets here. Earth. Terra Firma. Seems forever it's filled my thoughts, been my goal. And now...I'm here. What's Crash up to NOW?!?!? I'm ready when everyone else is ready. I'm ready. I love it too. LOOOOOOOOOOOOOVVVVVVE that shot of Moya at the space station. John always worrying, not that I can blame him. A little dig at Scorpy about the coms. I love John and 1812.